After traveling several days upriver by canoe, Raquel Quinchoquer and her group of national volunteers finally arrived at their intended destination deep within the Peruvian Amazon. They had come to deliver Operation Christmas Child shoeboxes to children of the Nomatsiguenga people group. Although a small but growing percentage of the tribe is Christian, the Gospel had never before reached the particular village Raquel and her group now found themselves in. 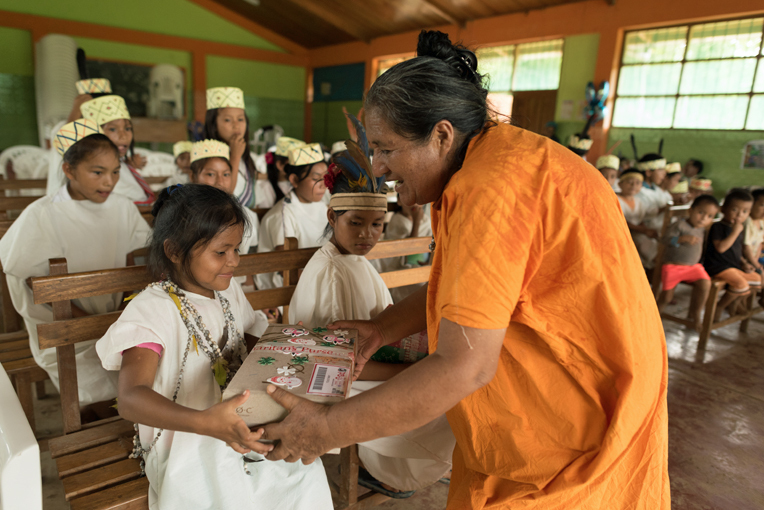 You Can Pack a Shoebox Raquel used their culture’s storytelling tradition to share the Gospel with them. Even though this village had never heard of Jesus Christ, they worshipped a creator who causes the river to flow and plants to grow. They believe this creator was taken from them and promised to reappear someday. From these tales, Raquel drew parallels to Christ’s death, resurrection, and promised return. The children who welcomed them to the village understood and asked to hear more. One girl asked, “How could a God love people like us?” Later, this same girl said, “Would you pray with me? I want to know this Savior.” She was not alone. Others joined her in wanting to follow Christ. Raquel distributes shoeboxes in a river community. After praying with the children, Raquel and the other volunteers surprised them with shoebox gifts. Amazed, they asked, “Why would someone who doesn’t know us send this?” Raquel responded by saying that people far away want them to know God’s love. Every box the children opened contained a pair of sandals in just the right size! Scripture is being proclaimed in some of the world’s most remote places through this Samaritan’s Purse project. People are hearing the name of Jesus for the first time ever. Please pray that these peoples will “sing to the Lord a new song, and His praise from the ends of the earth” (Isaiah 42:10, NKJV).